From the moment you step through its door, the newly opened Shakespeare & Co. just feels like a special place. For one thing, you’re no longer navigating a raucous, retail-filled Walnut Street. Instead, you’re standing on the wooden floor of a little sanctuary of sorts: Here, fresh coffee brews, thousands of books line the walls, and some kind of odd, futuristic machine spits out (almost) any publication you can think of. Every few minutes, the relatively quiet space buzzes with the whirring of an old-fashioned flipboard — you know, sort of like the one in 30th Street Station. 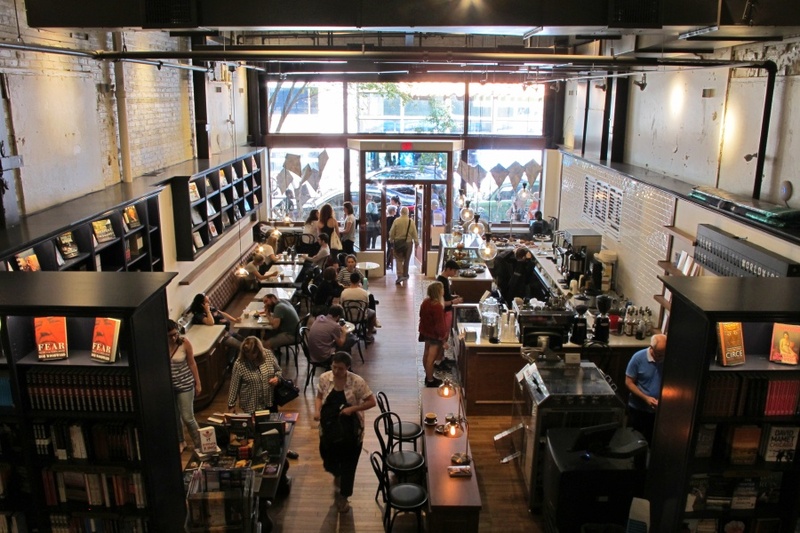 Shakespeare & Co., which opened last week near 17th and Walnut streets, is just about in full swing. 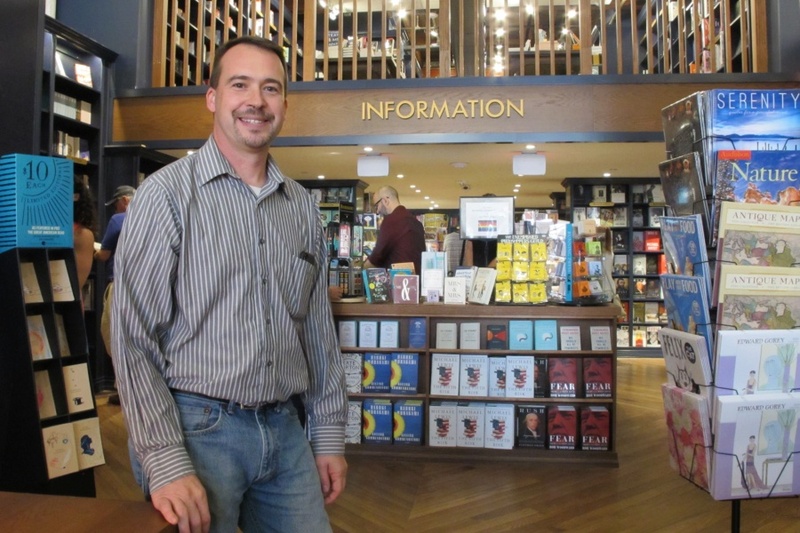 General manager Rick Rollins says the bookstore still needs a few finishing touches — small design stuff — but you wouldn’t know it when you’re sitting inside. Customers write, read, eat, drink, and peruse in a quietly comfortable way that might trick you into thinking the store is a longtime Philly staple. Really, Shakespeare & Co. is a New York–based brand that’s been set on expanding to a national presence since it began. The store’s Rittenhouse location is its first outside the Big Apple — which, in itself, is significant. But that’s not the only reason why the shop is shaping up to be a big addition to Philly’s literary scene. Here are the five biggest. 1. 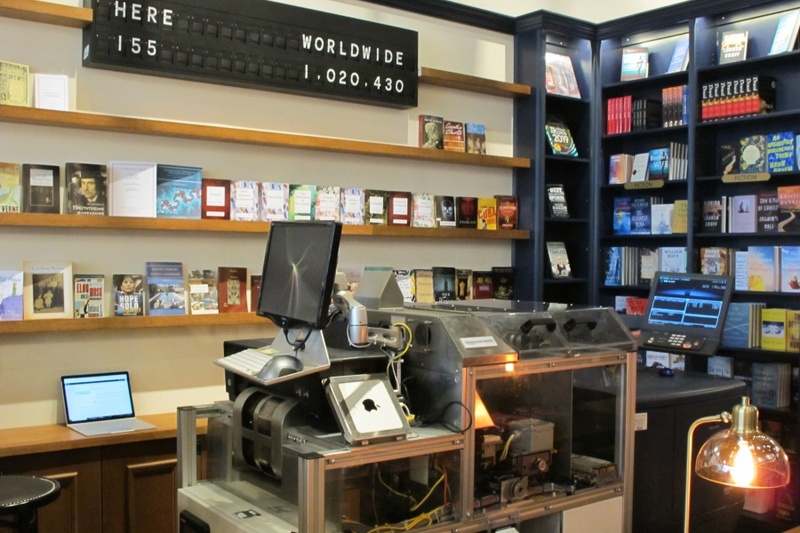 The shop’s “espresso book machine” prints books on demand. Shakespeare & Co.’s “espresso book machine” looks like 21st-century steampunk. At first glance, it sort of resembles an industrial printer or copy or fax machine. But through its plastic walls, you can see cogs and other inner-workings that make it seem downright mysterious. 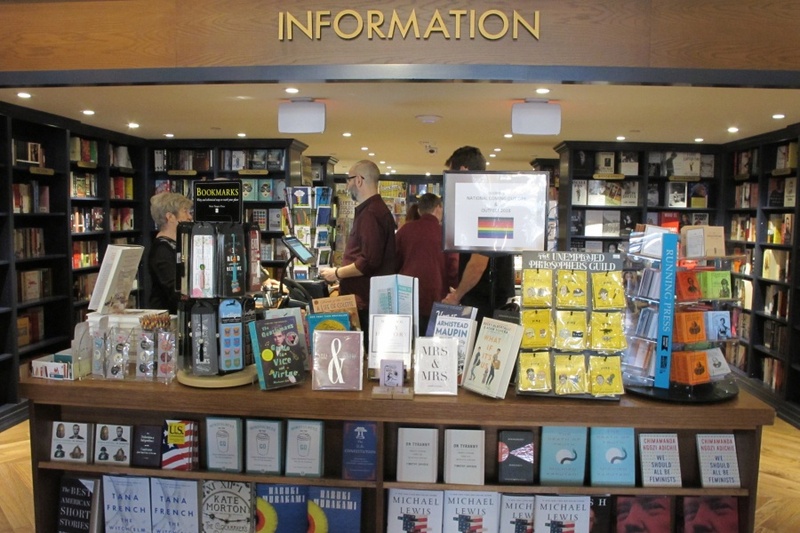 The book machine allows Shakespeare & Co.’s roughly 2,800-square-foot space to compete with the giant Barnes and Noble nearby, Rollins says. The independent store has a well-curated selection of hardcovers and paperbacks, but if you don’t find what you’re looking for on its shelves, you can probably pick it out from book machine’s roughly 7 million titles — and then print it out, right then and there. Voilà: Books — real paper books, still warm from the printer — on demand. This is the future. “It’s something that gives me a never-ending shelf, so to speak,” Rollins said. The book machine typically takes about three to six minutes to print publications. And it doesn’t only spit out well-known works: You can print your own manuscript — or drawing, or recipes, or whatever. So far, Rollins said, one guy came in and printed a collection of poetry for his spouse. In New York locations, some customers have made cookbooks for aunts and uncles. Plus, the store also offers a selection of titles in which you can swap your name (or your child’s) in place of main character’s. In a tremendous marriage, Shakespeare & Co.’s flipboard displays titles as they are printed from the book machine. Plus, every now and then, the flipboard (created by Philly’s own Oat Foundry) will display the number of books that the espresso machine in Philly — as well as other machines in New York — has printed. As of Wednesday afternoon, the number in Philly reached above 150, while the national number stood around 1,020,420. We’ll remind you that Amtrak is set to remove the historic flipboard in 30th Street Station — so we might have to come here when we’re missing it. And that’s not the only thing that’ll keep us coming back. 3. The store is beautifully designed. Thanks to the store’s glass exterior, Shakespeare & Co. is a sunny, airy space. It’s got a lot going on, but it’s not too cluttered: marble tables line the walls, and window countertops provide additional workspace. The store’s wooden floors and details lend it a sort of bookish, old-time charm, while kites displayed in the windows add a touch of playfulness. 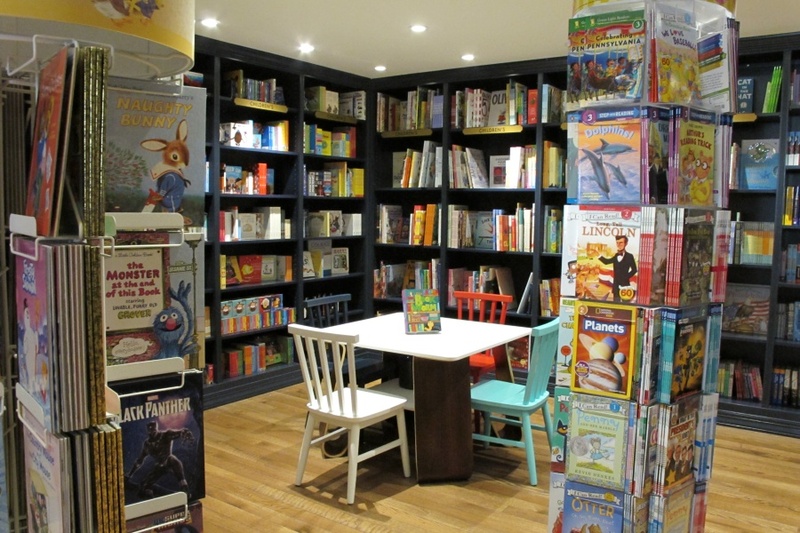 Plus: a blue-and-white tiled floor near the cafe, a section just for children and a balcony that allows you to look out of over the store — what’s not to love? “It’s important to us … because books are about paper, and we wanted to create a nice warm feeling.” Neller said. 4. 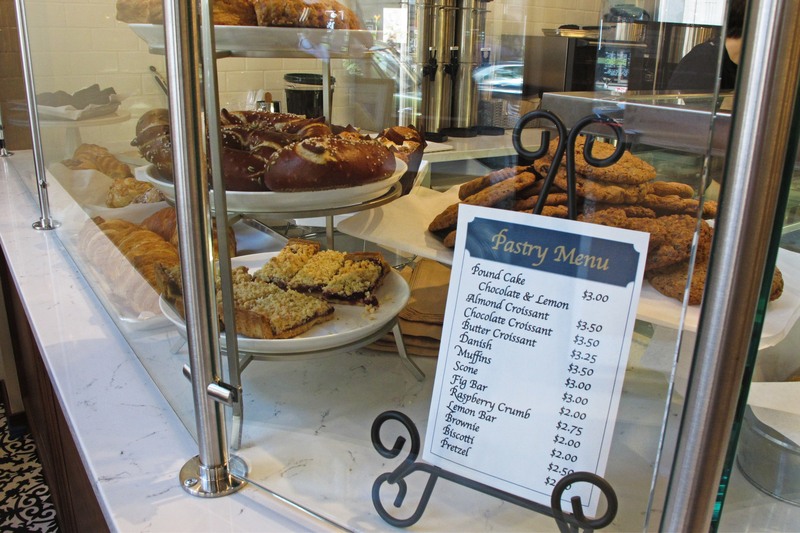 The cafe features locally made coffee, pastries and sandwiches. 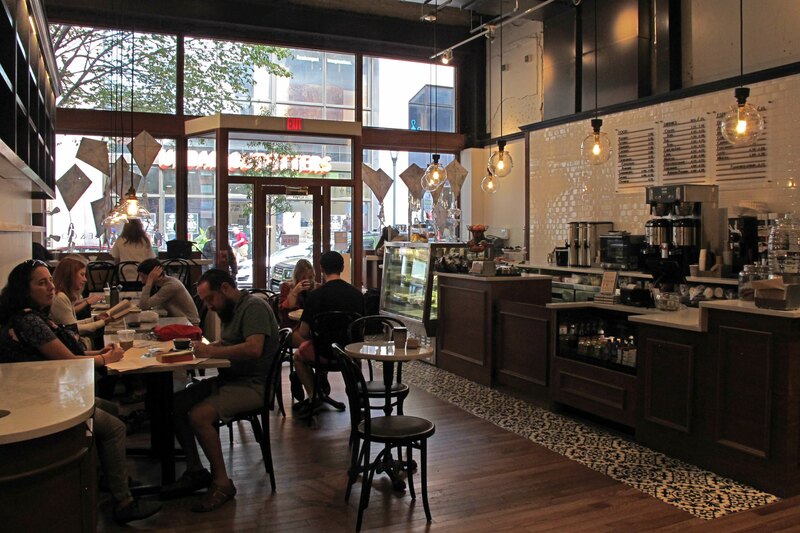 The store has partnered with the nearby Metropolitan Bakery for the pastries, as well as La Colombe for coffee. Right now, they’re serving sandwiches from Le Bus — though they’re exploring other local sandwich options as well. 5. The store will soon become a Philly outpost for writerly events. Starting in early November, the store will begin hosting readings, book signings, author discussions, book debuts and more. “We’ve already heard from a great number of local authors,” Rollins says. So far, Shakespeare & Co. has already held events featuring journalist (and former Philadelphia magazine editor) Stephen Fried’s recently released Rush, as well Dacre Stoker and J.D. Barker’s new supernatural thriller and “Dracula” prequel, Dracul. “Both of those books have done very well,” Rollins said. In a city with a ton of writers (and especially poets), a spot for literary events is more than welcome. 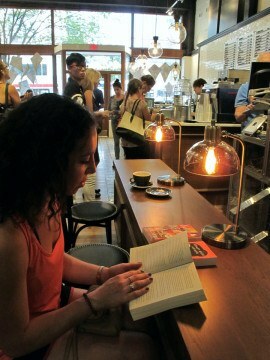 Check out more photos of Shakespeare & Co. below.